Pinterest is full of Freezer Cooking recipes, but what would logistically work your family? As a homeschooler, freezer cooking has really helped saved my sanity and keep up on household chores. Having a freezer meal at least once or twice a week has meant I can have more time to pick up the house, fit in piano lessons after a busy morning at Co-Op, or actually put away the laundry I folded. 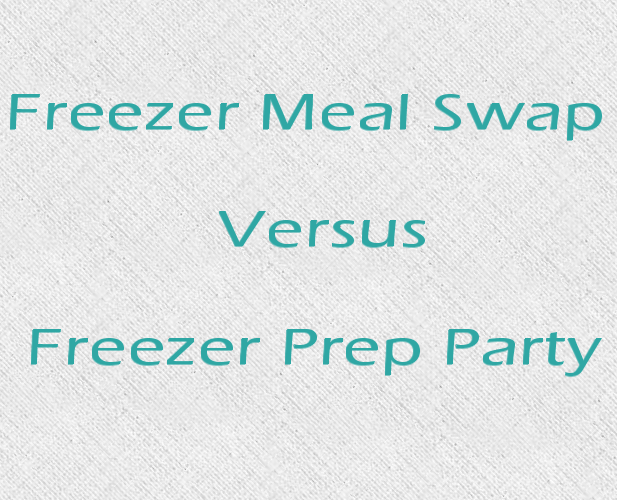 I have now done both a Meal Swap and Prep Party, and I loved both. A Prep Party is when one person buys all the ingredients (or each person buys their own ingredients for their own meals) and one person hosts, then we work together to put the meals together. I have seen a lot of blogs that said one person should do all the shopping, then split the costs it all evenly. Moms with young children could find a sitter and get cooking done without little ones around. Motivation to cook when you have a friend helping you. More Control of what recipes you bring home. Anyone with food allergies can sub their own ingredients in at party. Storage needed for buying so much food at one and organizing it so it can be cooked in one day. Less women can be involved. Many website recommend no more than 4 to 5 recipes (we did 7 and it was a bit much), and 2 to 3 women at a time for a freezer party so it doesn't get too complicated. Moms with young children would need to find a sitter to participate. A meal Swap when several woman cook multiplies of the same freezer meals on our own time at home ,then come together for a short swap. You bring the amount of items that you would like to bring home. For instance, if you have a small freezer and can only fit 4 freezer meals in there, you only bring 4 meals and leave with 4 meals. Women can do the cooking on our own time and less schedule coordinating. More variety in meat/dishes can happen with a large group of women cooking at their own homes. Less prep and clean up of Host site. Not as much control over dietary concerns or meal choices as the prep party. Amount of time and money you spend with vary depending the recipe you choose to bring. Moms with young children would have to find time to cook their meals at home. Less control over what recipes are brought to swap.